As I write this post, I can’t help imagining what it will feel like at this time Thursday night when I am up to my eyeballs (finally) in all things Spring Break. I’m envisioning an episode of This is Us, an adult beverage, and perhaps some Easter candy the bunny just won’t get a chance to deliver. Maybe I’ll throw caution to the wind and rent a movie, stay awake for the entire thing, and put extra butter on my popcorn. Don’t try and hold me back, friends – I’m going to let ‘er rip. This girl is going to calorically navigate every day of this vacation. Because let’s face it, sometimes we need to break the rules and revel in what feels good. Sometimes we need to abandon the stress, irritation, and seemingly endless march of…March. Sometimes we need to break the rules. Now I know, if I were you, I would be reading on in great anticipation of a reflective post that smacks at the very heart of pushing aside what’s prescribed and going instead with the deeply personal, life-altering, philosophy-bending, workshop work that fuels lives rich in reading, writing, and empathetic connections across our school communities. Well…did I mention I am only four class periods away from vacation? 344 total class minutes. 18 total hours on the clock. 27 miles there and back to my nice warm bed. Dozens of warm smiles and well wishes for a well-deserved break to all my lovely students and colleagues. Some will voyage to lands far and wide. Some will go on great adventures. I will gladly go to my couch. My brain is fried. As such, I wanted to share with you my experience with a March Madness Book Bracket, in the hopes that if you haven’t tried this yet, you’ll consider it for next year, or even better, you will ditch the March Madness component and just create your own Book Battle for April or May of this year to stir up passions around the current favorite titles in your classroom. A random picture I saw on Twitter at some point that highlighted the excitement around a classroom book battle. March Madness Hoopla (punny is as punny does) here at Franklin High School. Our school is blessed with a great number of hugely passionate, committed, and just all around awesome teachers and administrators across the building. This past month, Franklin saw the advent of our annual March Madness school-wide event. The incomparable Pat Gain, AP Environmental Science teacher to the stars, organizes an extravaganza the brings the whole school together in excitement, friendly competition, and support of Franklin’s Relay for Life and Best Buddies. Students earn raffle tickets for possible school spirit, teams organize to battle it out on the court, and the entire school gathers for a pep rally to watch the championship games and other fun at week’s end. This year, it inspired me to jump on the bandwagon and create a book bracket in my room. After the fact, I found this awesome March Madness Book Bracket that includes book trailers, printable brackets, a bracket reveal video, and the wherewithal to organize it all way ahead of time and share it so classes across the world can vote. You can vote in their championship matchup between The Hate You Give and Scythe right now! These people have t-shirts. It’s legit. Meanwhile, I’ll be over here with my humble pie and share with you what I did and what I want to try to do for next year. First, a disclaimer. I said I broke rules. I did. But it still worked. There was no actual bracket to fill out. I don’t know a lot (enough, much, anything) about basketball. My bracket had no actual lines. But it all worked out. Check it out below. Each of my classes did a quick write on their favorite read so far this year. We chatted after writing, reminisced about great books, added to our “I Want to Read” lists, and then put some titles up on the board. Over the course of a few days, the suggestions for awesome books grew, and I picked 16 that represented the most consistently raved about and most passionately advocated for in each class. I matched up the books somewhat appropriately in logical pairings. Two classics up against one another. Two historical fiction texts. Two books in verse. Etc. I printed images of the book covers for each title and set up a rudimentary book bracket on the back wall. A Google Form shared on Google Classroom gave my students the opportunity to vote in any/all of the matchups they felt compelled to vote for. I also shared this Google Form with other members of the English Department and encouraged them to share the link with their students and to vote for their own favorites. After the initial matchups, I was left with eight books in illogical pairings, so I had students vote for their top four choices one week, their top two the next, and now we’ve arrived at Championship Week. Before voting each round, students lobbied for the books they felt should move on to the next round. Which were the most worthy of advancing? Which changed student thinking? Which were the page-turners? It was awesome to hear kids going to the mat for their choices, and even when their favorites lost, they continued to try and sway people to still give the book a try. It did make it to the Big Dance after all. Start the whole process earlier. Give students a chance to pick up a book or two from the bracket and add fuel to the fire of how many kids have a book in the race. Complete actual brackets for some random and cheap prizes from my Kelly Gallagher-inspired Bag of Fun Crap. Random pairings. I love the idea from the link above to let the chips fall where they may and let books battle au natural. This eliminates my perceived issue of illogical matchups. Brackets are made to be busted! Measure twice, cut once. My book covers were almost too big. I had to move furniture! The hallway may be a more appropriate space and would promote the matchups to a wider audience as well. My pithy neighbor Brandon suggested that tape between the matchups would make it look a lot more like an actual bracket. Touché. Expand the empire and work to involve more students, more grade levels, more opinions, more passionate pleas for books to advance. More. Madness. My March needed a bit of madness and I look forward to doing it again next year. Though we didn’t have any actual brackets to fill out ahead of time, or league sanctioned seeding, or even actual matchups past the first round, the results involved a whole lot of passionate talk and writing around books. When students hustle in the room to see which books are winners, as opposed to hurridly taking one last glance at their phones before the bell rings, I consider it a slam dunk. (He he…told you I needed a vacation). Our bracket is down to The Nightingale by Kristin Hannah and When Breath Becomes Air by Paul Kalanithi. Which one would be your winner? Which books could go the distance with your classes this year? Please leave your comments below! Lisa Dennis teaches English and leads a department of incredible English educators at Franklin High School near Milwaukee. Her knowledge of basketball is limited, but her support of underdogs is fierce. Let’s Go, Loyola! Follow Lisa on Twitter @LDennibaum. I should have written this post yesterday. Yesterday was 9/11, and I always try to incorporate some lesson about the events, emotions, and effects of that day into whatever our focus is in class. It’s important we always remember. Without really meaning to, I shared three books with students on Monday in three different ways. Thus, the idea for this post on engaging students in reading by mixing up our book talks. Read a poignant, exciting, or particularly intriguing passage from a book. Over the weekend, I read The Memory of Things by Gae Polisner. I found this a touching story about love and loss and resilience — all topics my students can relate to. What does it mean to be responsible? How do we fight our fears and struggle through the tragedies that terrify us? In my book talk, I spoke about the characters in the book: a young man trying to prove his worth to his dad, and a young woman who we learn is in conflict with hers — both struggling with the realities in NYC on the tragic Tuesday of 9/11. “I move with the crowd, away from downtown Manhattan. A crash of thunder erupts–another explosion?–and the flow startles and quickens. Someone near me starts to cry, a choked, gasping sound, soon muted by a new wail of sirens rising at my back. I stop and turn, stare frozen. People rush past me: faces twisted with shock and fear, mouths held open in O’s, others only eyes where their noses and mouths have been covered with knotted sleeves against the toxic, burning reek. I search fro Kristen or Kelly, or Mr. Bell, but I lost them all as soon as we got to the bridge. I don’t see anyone I know from school. I don’t see anyone I know. I press my sleeve to my nose– Don’t think, Kyle, just move!–but feel stuck gaping at the place where the city has vanished beyond the thick brown wall of smoke. There’s a lesson in imagery in there I may return to sometime. We are writing narratives right now, so I bookmarked this for later. For now, it’s a good teaser and an effective book talk. 2. Show a movie trailer — but play up on how the book is always better. My students love videos. They admit to spending their entire lives on YouTube, so any chance I get to show a video clip I take. If you’ve read Extremely Loud and Incredibly Close, maybe you feel like I do about the movie: I loved it, but the book just gives us so much more detail, description, characters, and craft to love. Oh, how I love the craft in this book by Jonathan Safron Foer. For my book talk, I first flipped through the book, showing student how Foer plays with white space, page markings, and photo essays — all which play into how he develops the plot and constructs meaning. I talked about the parallel plot line and how the movie makers diminish, change even, the important second storyline. I explained how this book taught me more about author’s craft than anything I’ve ever read. Then, I showed the movie trailer. Use a passage as a quick write prompt or as a craft study. Have you read The Red Bandanna: A Life, a Choice, A Legacy by Tom Rinaldi? Just a few pages in, and your heart will swell. As I read the books I know I will share with my readers, I mark passages that make me think and feel. Important moves for any reader. I model these moves as I share books and writing ideas with my students. This passage from The Red Bandanna tears me to shreds every time. In my senior English classes, I talked about the heroics of Welles Crowther, the main character in the book, and then students wrote in response to the questions: What do you carry, what truth could it possibly contain? What meaning could it hold? In my AP Language class, we talked in our groups about the word choice, the interesting syntax, the tone, and then students wrote their answers to those questions, trying to imitate the writer’s rhythm and descriptive language. In all my classes, we talked about 9/11, our thoughts, our feelings, and why they matter to the lives we live now. We made connections to texts and to one another as we shared our thinking and our writing. That to me is an added bonus of an effective book talk. I know my students will read more the more I talk about books. I am the salesperson, and they are the often skeptical customer. I’ve learned that mixing up how I talk about books matters. And getting students interested in reading pretty much anything these days matters most of all. Do you have ideas on mixing up our book talks? Please leave your ideas in the comments. Amy Rasmussen loves to read, watch movies with her husband, and tickle her five grandchildren. She’s in the market for a lake house and likes to shop thrift stores for books and bargain furniture. Someday she’ll be disciplined enough to write a book about teaching. For now, she teaches senior English and AP Lang and Comp at her favorite high school in North TX. Follow Amy on Twitter @amyrass, and please, go ahead and follow this blog. Workshop affords so many opportunities to explore with the students in front of me as opposed to present a set curriculum to whomever happens to be seated in my classroom. It’s teaching through interaction, and in this case, it’s teaching straight from the kids themselves. We see it in workshop all the time. Students given the tools to explore the world as readers and writers, and encouraged through personalized learning, quite often take their learning to places our old lesson plan books didn’t always accommodate. One of the best opportunities for this classroom growth is having students do more and more of the talking. With the right modeling and specific expectations around that student talk, the classroom becomes a place students lead through inquiry, as opposed to follow through completion of teacher set tasks. Morgan quotes Judy Brady’s “I Want a Wife” to analyze how the repetition supports the sarcastic tone and proves the point that since they do SO much, everyone should want a wife. LOL! It happened yesterday morning, in fact. My AP students were participating in small group graded discussions. Just reading the last sentence makes me cringe (yes we use a rubric, no, the conversations don’t have to be formulaic as a result), but with choice in which readings from our unit they wanted to discuss and some guiding questions throughout the discussion, our conversation about gender and the implications of historical stereotypes on a modern world (their direction for the discussion, not mine) took an interesting turn. discussion prepared to drive conversation from the perspectives of authors like Brent Staples, Deborah Tannen, John and Abigail Adams, and Judith Ortiz. Perspectives that regard gender through stereotype, race, satire, narrative, an exchange of letters almost 250 years ago, and visual texts. Did I just sit back and let them talk, free-for-all style? No. This conversation took practice, feedback, and correction over the past few months. Today, it took redirection on some occasions and additionally it took specific intervention for those students reluctant to participate. Additionally, had it been a lower-level class, I would have been a bit more actively involved to start. But as you well know, students at any level are capable of, and actually far more likely, to get actively involved if their efforts for comprehension are supported and their exploration of the text is encouraged. We work specifically on ways to communicate both agreement and polite disagreement, so students can help clarify the text as well as analyze it. Like any solid workshop component, it involves careful teacher planning and modeling, but equal parts careful student leading as we gradually release them to own their own education. We assess students on their preparation for the discussion with visible notes and use of specific text to support their points and their leadership within the group. That leadership can be exhibited through meaningfully involving others to bring them into the discussion with a question, synthesizing ideas they have heard so far, and/or including insights from additional research on a particular topic to extend discussion beyond the reading. I spend a whole class period for discussions, breaking the class into groups of 7-10 students so all voices have more opportunity to be heard. Students not in the discussion have specific work to complete, sometimes by the end of the hour. For feedback, I type comments and insights while the students are speaking, so I can quickly copy/paste them into the comment section of my feedback form (A Google form emailed directly to students with 2 Common Core based rubric bands as dropdown tabs so I can just click the score for each band, include specific typed feedback, and often get that feedback out to kids the same day). Another opportunity for seriously impactful student talk, is handing over the daily book talk to the class. One of the many benefits of this scenario is that I can tap into growing student enthusiasm about books and have my kids spread the book love directly with each other. Don’t get me wrong, my book talks are something to behold. Part forensics piece, part reader’s theater, and part screentest for the literary loony bin, I sell books much like I would envision the traveling vacuum salesmen of yore putting food on the table with a pitch of salvation not just for the home, but the soul. It’s not just going to clean your carpets, it’s going to change you life, Ma’am. Your life. But, let’s be real. Though I sprinkle my classroom with good will, good cheer, and good books, I’m not the best salesperson in the room. If you’re going to sell the vacuum with radial root cyclone technology (I Googled that), or the book with 389 scary looking pages on dystopian fantasy rooted in a chromed society, you need to know your audience. You need to relate to your audience. You need to be one with your audience. There are plenty of reasons to get kids doing your book book talks, not the least of which is I can’t read fast enough these days to keep up with the need for the type of really passionate and informed book talks that come from having read the whole text (Books do sell themselves sometimes, just by reading the back cover and a page or two at the start, but I love to hook kids with a section from the middle to show the impact of the rising action or depth of character development). Priyanka book talking Stitches, a graphic novel by David Small, under the document camera. Students trust one another’s opinions. Yes, often more than mine. I sell hard, but at the end of the day, I’m usually still the biggest book nerd in the room, and therefore I think I am occasionally regarded in much the same way as the Dancing Grannies in a holiday parade: Enthusiastically adorkable, but a bit of an anomaly to be trusted only at a distance. They find titles, authors, and series that aren’t yet on my radar. Despite my best efforts, I can’t read fast enough or comb enough best of lists to meet the recommendation needs of over 120 kids. But when the classroom experiences a new student perspective on reading each class, additional book talks at their tables after reading, speed dating with books, and an invitation to help grow our classroom library with tax free, gluten free, guilt free donations of gently used books, everyone wins and the depth of our classroom repertoire grows. Their enthusiasm is relatable and often focused on books that don’t speak to my own bibliophilic tendencies, but can ignite the reading sensibilities of their adolescent peers. For example, I took several YA Lit books home at the start of last summer. Two days in, I was already struggling with the voice. It grated on me (no offense scholars) after hearing it all day in person for 180 days. So when a student book talks The New Guy (and Other Senior Year Distractions) by Amy Spalding, and two sophomores in my class (who have struggled to meet reading goals week after week) add it to their “I Want to Read List”s, that’s another win, because we can’t push kids to deepen their reading if they aren’t reading. First hook them, then book them with more challenging pieces. I offer up the option to produce their book talks digitally and for some students, this is what makes the entire experience meaningful. Students sell their books through book trailers, compilations of related imagery and voice over to meet the same requirements of a live book talk. I’ve had kids include clips of author interviews, live action fight scenes with voiced over dialogue directly from the text, and this year, I have a student who wants to read over the top of a mannequin challenge he plans to shoot to represent some of the major action in the text. What results is growing book lists, renewed enthusiasm as students go back to books they’ve read and revisit their love for the text, and involving each and every single student as a valued reader in our classroom community. We’d love to hear from you! What tips and tricks for student talk make their way into your daily workshop practice? Please comment below! A few months back, my family was featured on a commercial for a local furniture store. We got paid handsomely to sit on a couch and look happy (easy) and cute (easy for my toddler). No dialogue. No acting. Just…sitting. It was well within my wheelhouse. When the commercial ran, my daughter Ellie would race up to the screen in our living room, point excitedly, and exclaim, “LOOK! It’s ME!” Anytime she heard the telltale voice of the announcer, she would drop whatever she was doing and run to see if she was “in the television” again. Her reaction was adorable (I’m biased), and pretty typical for a little kid who loves smiling for pictures and seeing herself in videos, but it would seem that as we grow, our perception of ourselves on screen tarnishes a bit. I mostly noticed how painfully true it is that the camera adds ten pounds. How cruel. Thankfully, others often aren’t paying attention to such trivialities (I hope). What’s important is the content. In our classrooms, content takes many forms, but no matter the medium, we’re looking for the message to come through loud and clear. For example, I teach my students when we work with speaking and listening standards that if we keep the message on pointe (Hurry in for the one day sale…) and organized (Hurry in today; it’s a one day sale), our audience will hopefully focus on the content (Wow, I could save serious bank on a sofa…today) and not our appearance (Hey, she looks like she packed on a few pounds. Ten. It looks like she packed on ten pounds). So, let’s consider what this means for readers workshop in our classrooms. It’s simple: We want to hook our audience. The content is clear (This book is fantastic and you’ll love it too! ) and so is our mission (Read this book!). With all this in mind, I’m going to ask you to come with me to a place that might make some of your a bit uncomfortable. However, in terms of risk-reward for the promotion of choice reading, this will be well worth the effort. Let’s take our book talks to the big screen! Just as Ellie loved seeing herself on screen, students of the digital age delight in the visual medium. So, to add to our book talk repertoire, and even broaden the audience for books that delight our reading communities, here are three simple ways to switch up book talks in your classroom and keep things fresh and clever (personal screentime optional!). Guest book talks caught on tape! Several months ago, I read and delighted in Jackie’s post on ways to stir up book talks. One of the suggestions I got rolling with was the guest book talk. Jackie insightfully wrote that “students need positive reading role models in all of their educators.” How true! I grabbed my phone and went down to Señora Ovalle-Krolick’s room. She had been speaking passionately just a few days before about Richard Wright’s Black Boy. I have yet to read this classic and I knew that her enthusiasm for the text would captivate my students. Before she could say no, I handed her the book and told her that I needed her passion. I asked her to tell me a bit about the book, her reading of it, and why she was recommending it. Her video, captured in one take, spoke beautifully about the text and her connection to it. Due to scheduling, it wasn’t possible to ask Alejandra to come to each of my classes, but with the video below, I was able to share it with all of my students. I’ve been working on my Social Studies neighbor next. He’s set to book talk via video next week. And all we need is my phone to get recording! Go big or go home – book talks on our school’s student newscast. Each week, the fantastic video production students at Franklin High School produce The Saber Roar. In recent months, I’ve helped an amazing student, Tasha Kappes, start a segment entitled Saber Reads. Students, teachers, and administrators (even a few from the district office!) have signed up to book talk some of their favorite selections! Here is Jessica Lucht, one of my amazing AP students book talking The Young Elites by Marie Lu right around minute 2:45. In this episode, zip to minute 3:40 to see a book talk I did with my colleague, bestie, and partner in crime, Erin Doucette on Kristin Hannah’s The Nightingale. Borrow brilliance from the internet. I learned about Reel Reading from Amy. Book trailers combine all of the elements of a great book talk, with the added bonus of moving pictures, music, and sometimes analysis or quotes. In a post from several years ago, Amy’s students came through with some wonderful book trailers.Jackie talked about using book trailers in this post from last year, and I used a few of her links when I was feeling stuck in supplementing my own book talks recently. Just last week I wanted to book talk the Pulitzer Prize winning book The Road by Cormac McCarthy. I found the book trailer below the hooked several students with its haunting music and connection to the movie that was made from the book. What ideas do you have for taking book talks to the big screen? What questions do you have? Please feel free to leave your comments and questions below! After a slew of snow days and an extended year that pushed the end of school into the second-to-last week of June, my students’ motivation lagged as we approached our final month together. They needed an engaging project that still proved to be challenging and fun. Inspired by Amy’s work, my students and I celebrated the end of the reader’s workshop with a final book trailer project. The process was organic; students latched onto the idea of watching mentor texts and dissecting the craft to gain a firmer understanding of the writing genre. Over the course of a few days, we analyzed and discussed the differences between the book and movie trailers for John Green’s upcoming film Paper Towns, a class favorite. We combed through countless examples of professional book trailers, dissecting the craft of the films and looking at the cinematography, hook, pacing, script, music, and scene choices. Finally, after brainstorming and storyboarding, students used Stupeflix, WeVideo, Puppet Edu, or iMovie to generate stunning book trailers. The results blew me away. Here is a small sample of some of the trailers I’ll be using to supplement my book talks next year. **Make sure to unmute the video. In some cases, the sound doesn’t automatically play. For about two years now I’ve posted book trailers, author interviews, and a few other online resources (like the amazing Pinterest boards for The Goldfinch and Alice Bliss) as a way to help guide my students into the world of reading. I’ve found there are two prime ways that students get interested in a book. 1. I have to love it. If I read a short passage and share my experience while reading a certain book, and students see how it made me think or made me feel, without question, at least one student asks immediately to check it out from my classroom library. Usually there’s a waiting list. 2. I have to help them “see” the book. If I show books trailers, even movie trailers, and help students visualize the story line or the characters or the action, even my struggling readers are more likely to at least give a book a try. Sometimes that’s all it takes. I have had great success in developing readers this year, especially this year. Maybe I finally figured out how my personal passion for books can work to accelerate student interest in books. More likely it’s the time I allowed for my teens to explore the bookshelves, talk to each other about what they are reading, and the time I gave them to read. Every. Day. My students will evaluate their reading lives next week as the last task I ask of them. They will interview each other and think about our growth as readers. I know that talking about books, showing book trailers, (and investing a lot of time and money in a phenomenal classroom library) is why I am going to smile all the while as I read their evaluations. 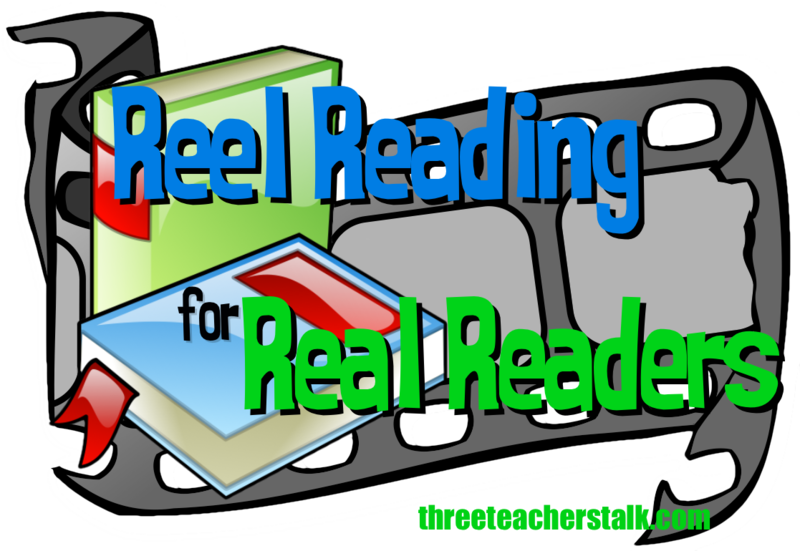 Reel Reading post will take a break this summer. I’d love to hear of your successes with students and reading this year.